Microsoft is making its disc-less Xbox One S official today. After weeks of leaks, the software maker is unveiling the Xbox One S All-Digital Edition, which is priced at $249 and will be available on May 7th. This is a new model that will be sold alongside the original Xbox One S, and the more powerful Xbox One X. The big selling point here is that this All-Digital Edition will not ship with the Blu-ray drive, cutting the price slightly by $50 (recommended retail price). Microsoft is including a 1TBB HDD on this new digital model alongside digital versions of Forza Horizon 3, Sea of Thieves, and Minecraft in the box. The hardware is exactly the same as existing Xbox One S consoles, just without the 4K Blu-ray drive. 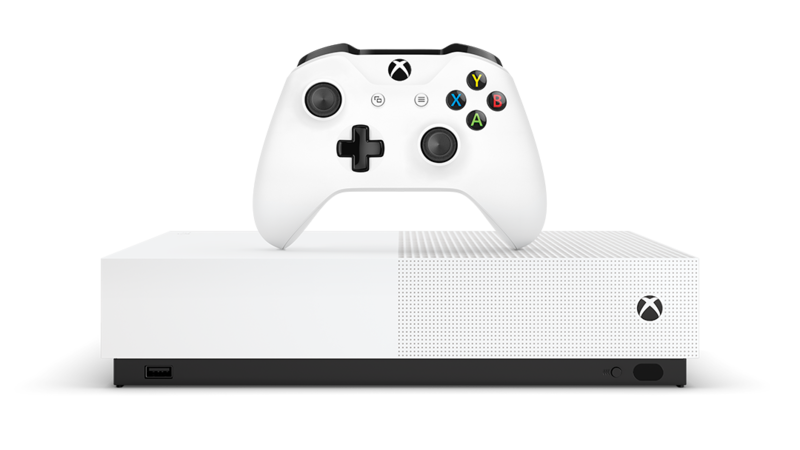 “The Xbox One S All-Digital Edition is $50 less than Xbox One S and we expect to maintain at least this price difference between the two consoles,” explains Jeff Gattis, general manager of Platform and Devices Marketing at Microsoft. This is $50 less than the recommended retail price of $299 for the existing Xbox One S, but there are regularly bundle deals available for around $230. It’s not clear if we’ll see similar bundles for this all-digital version. Microsoft is clearly testing out the idea of digital-only consoles, which was part of the original vision for the Xbox One. Microsoft had originally planned to let Xbox One users share any games digitally, but a backlash over the used games policies and online check forced the company to reverse most of its more promising plans. Microsoft has been aggressively pushing its Xbox Game Pass recently, a subscription service that provides access to more than 100 Xbox games. Xbox Game Studios titles like Sea of Thieves and Crackdown 3 launch first on the service, and Microsoft even recently added Minecraft to Xbox Game Pass. A disc-less console with a digital Xbox Games Pass subscription is now a reality. Microsoft is also working on an xCloud game streaming service that will stream digital games to PCs, consoles, and mobile devices.